Congress National Spokesperson and President of All India Mahila Congress Susmita Deb targets PM Narendra Modi, government on Rafale deal and demonetization. 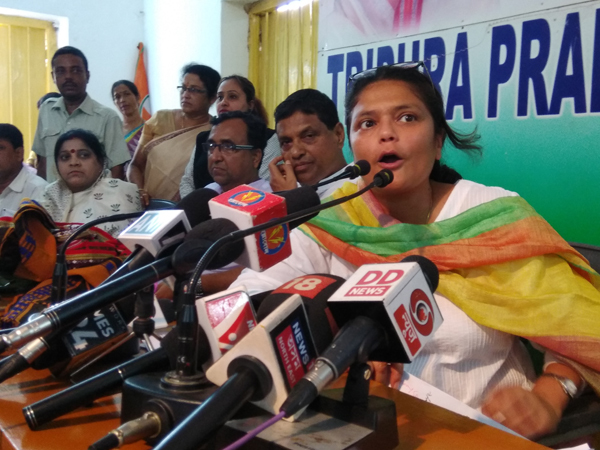 Addressing the media, the AIMC president Deb on Friday launched a blistering attack on Prime Minister Narendra Modi-led NDA government over the alleged Rafale deal scam and the issue of demonetization in 2016. The Congress young leader attacked PM Modi on the Rafale defense deal alleging that the deal was signed to help Reliance Infra and Reliance Defence Ltd Chairman Anil Ambani which inspite having no experience in manufacturing aircraft was allowed the ‘offset contract worth Rs 30,000 crore bypassing the PSU Hindustan Aeronautical Limited that has been making aircraft for last 70 years. She alleged Modi who calls himself a ‘chowkidar’ has become a ‘bhagidar’ in Anil Ambani’s new company which was formed just 12 days ahead of the Rafale deal and a defense contract of Rs 1,30,000 including the ‘life cycle contract’ of the aircrafts handed over to the new company. The Congress leader further claimed that the negotiated price of the Rafale fighter jet was way higher than the one negotiated earlier. “Why was an aircraft that was for Rs 520 crore three years back was bought for Rs 1,600 crore,” she asked. She demanded a Joint Parliamentary Committee probe into the Rafale deal. The Congress leader also targeted Finance Minister Arun Jaitley and Defense Minister Nirmala Sitaraman. India and France signed a deal worth Euro 7.87 billion (Rs 59,000 crore approximately) on September 23, 2016 for 36 Rafale jets. The delivery of the aircraft will start from September 2019. She termed the 2016 demonetization as “country’s biggest scam” and alleged that it was a well-planned move to help the cooperative bank of BJP president Amit Shah and his son’s company. According to her demonetization destroyed the economy and led to unemployment, inflation, death of farmers, small business and poor people. She also said that in the coming 2019 Parliament election Congress shall make demonetization and Rafale scam the main issue against Modi government. Deb was accompanied by local leaders including Tripura PCC president Birajit Sinha.